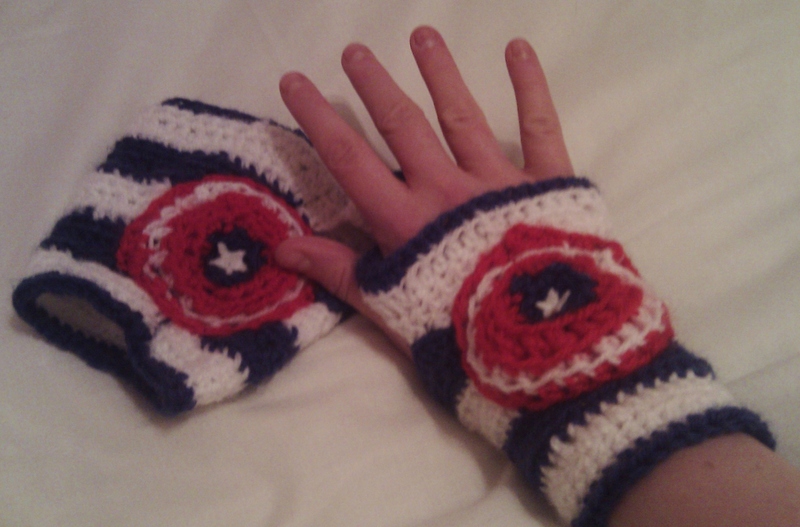 As promised, here is my capatain america gloves pattern. I have made this up from scratch although was inspired from other patterns. Any questions just let me know! This pattern is free! 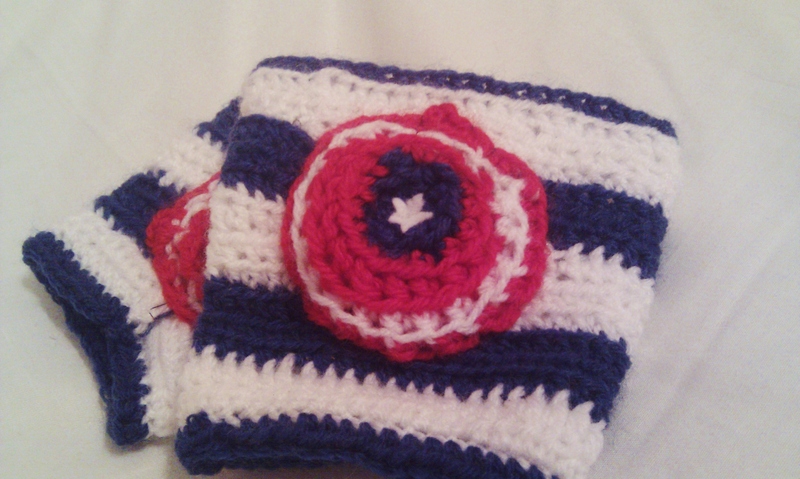 Red, Blue and White Yarn, 4ply. chain 30- 40 depending on hand size. Chain 1, miss the first stitch in the chain. Half Double crochet into each other stitch on the chain. Tie off the blue yarn. Join on the white yarn into the first link in the chain with a slip stitch. Chain one, miss the first stitch in the chain. Half Double crochet into each other stitch on the chain. Chain one, miss the first stitch in the chain. Half Double crochet into each other stitch on the chain. Turn your glove. Chain one, miss the first stitch in the chain. Half Double crochet into each other stitch on the chain. Cut yarn and tie off the white yarn. other stitch on the chain as normal. Turn your glove. This adding stitches compensates for the hand getting wider around the thumb. Chain one, Half double crochet into the first stitch twice. Continue Half Double crochet into each other stitch on the chain as normal. Turn your glove. Chain one, Half double crochet into the first stitch twice. Continue Half Double crochet into each other stitch on the chain as normal. Cut yarn and tie off the blue yarn. Copy row 2-5. Your glove will be large enough now and so will not need any extra stitches. Half double crochet 5-8 stitches depending on how large you would like the thumb hole. Chain 10 single crochet, unattatched to the rest of the glove. You will have 10 stitches missed on your glove. At the end of this missed section, attatch the single crochet white chain onto the blue with a half double crochet and continue to the end of the glove. Turn glove. Chain one, miss the first stitch in the chain. Half Double crochet into each other stitch on the chain. Turn your yarn. Join on the blue yarn into the first link in the chain with a slip stitch. Chain one, miss the first stitch in the chain. Half Double crochet into each other stitch on the chain. Cut yarn and tie off the blue yarn. Remember to check you are making one left glove and one right glove, they work with the same pattern but one is sewn inside out. Line up the ends, use either colour of yarn. Use a slip stitch to tie the yarn onto the glove. Push your hook into the first link of the chain on the other side. There should be 2 hoops on your hook. Yarn over hook, pull yarn through both hooks for a singlecrochet stitch. Chain one. Hook into the next chain on both sides of your glove, yarn over hook, pull through both hoops. chain one. Continue up to the top of the glove. Slip stitch your yarn and tie off. Foundation Ring BlueChain 5, Slipstitch back into the first link in your chain. Chain 1, Half double crochet into each link in the ring. On the last link, put another half double crochet into the link. Slip stitch into the first link to complete the ring. Tie off the wool. 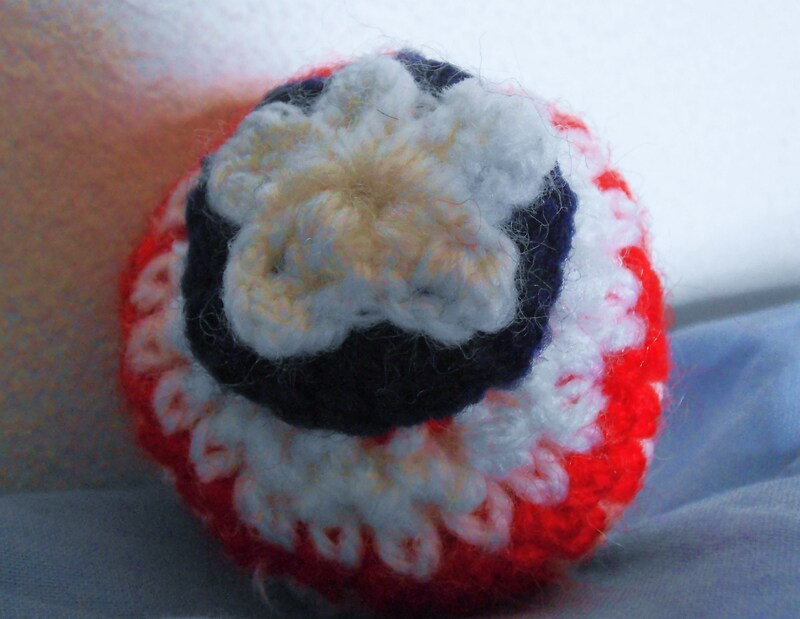 Slip stitch the red yarn into the ring, chain 1. Half double crochet into each link in the ring, On the last link, put another half double crochet into the link. Slip stitch into the first link to complete the chain. Chain 1, repeat. Tie off the yarn at the end of the slip stitch. Slip stitch the white yarn into the ring, chain 1. Half double crochet into each link in the ring, On the last link, put another half double crochet into the link. Slip stitch into the first link to complete the chain. Tie off the yarn at the end of the slip stitch. Slip stitch the red yarn into the ring, chain 1. Half double crochet into each link in the ring, On the last link, put another half double crochet into the link. Slip stitch into the first link to complete the chain. Tie off the yarn at the end of the slip stitch. 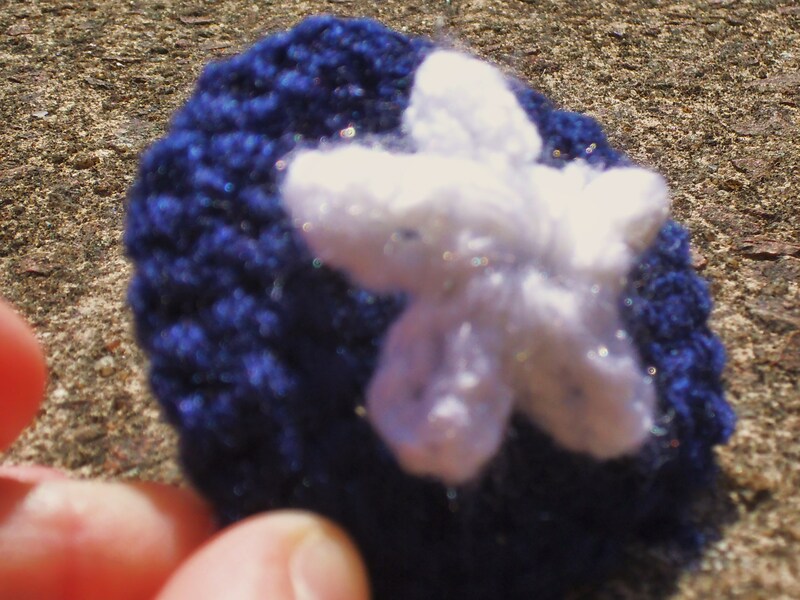 Cut a small star out of your white felt. It need only be about 2cm wide. 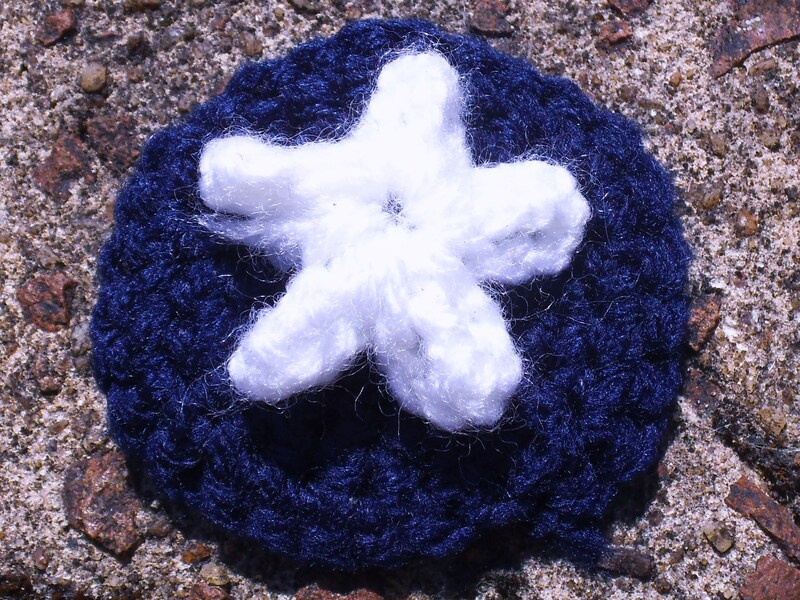 Use your needle and thread and sew the middle of the star into the blue centre of the circle. I find only a few stitches in the centre hold it in place. Use your needle and thread and sew the red ring onto the rest of the glove back. And that is you all done! Ta dah!